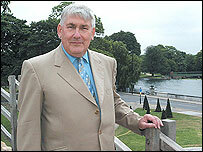 The mayor of Bedford has died in hospital two weeks after he had emergency heart surgery. Frank Branston, 70, of the Better Bedford Independent Party, was taken to Bedford Hospital on 30 July. He was then transferred to Papworth Hospital in Cambridge where he had a four-hour operation on his heart. The former journalist, who founded a town newspaper in the 1970s, was the eastern counties' first elected mayor in 2002 and was re-elected in 2007. In a message to staff, Bedford Borough Council's chief executive Phil Simpkins said: "It is with great sadness and regret that I have to inform you that the mayor, Frank Branston, passed away earlier today. "I am sure you will join with me in wishing his wife and family our very sincere condolences at this time." Tricia Turner, leader of Central Bedfordshire Council, said she had worked closely with Mr Branston for several years and was saddened by his death. "Frank was a tremendous character who always spoke up for Bedfordshire and its people and will be greatly missed in the county," she added. "Frank's family will be uppermost in the thoughts and prayers of everyone, both councillors and staff, at Central Bedfordshire." Mr Branston is survived by his wife, Marlies, and their daughters Naomi and Antonia.